Love art? Care about future generations? Get to the Abacus on Saturday! A group of artists are holding an exhibition at the Abacus on Saturday to call on the Welsh Government to improve the Well-Being of Future Generations Bill. They think the current proposals do not go far enough, and want to create a truly strong and effective sustainable development law for Wales. 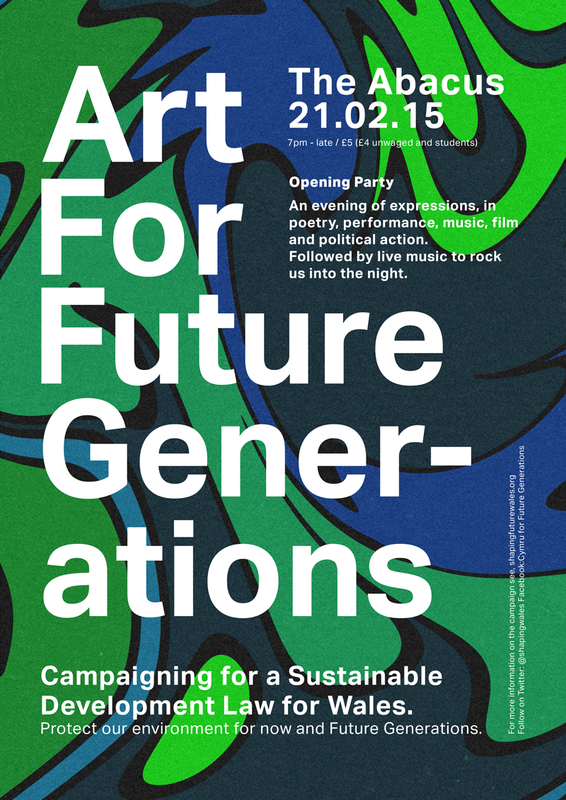 The Art for Future Generations exhibition will run from the 21 to 27 February 2015. The exhibition will kick off with an opening party on Saturday at 7pm, featuring a number of celebrated poets, performers and musicians. These include Mab Jones, the poet in residence for the Botanical Garden of Wales, folk singer-songwriter Maddie Jones, and rock bands Third Party and Art Bandini. “All the art work on display is inspired by our natural environment, the recognition that she is being destroyed at unprecedented rates and that we must act urgently to enhance and protect her. “We are calling on the Welsh Government to pass a law with a clear definition of sustainable development and a strong duty on public bodies to actually achieve sustainable development. Tickets can be bought on the door or in advance for £5 with all proceeds going towards the campaign, for more information visit the Facebook page –https://www.facebook.com/events/881188991944819/?fref=ts .